A NARS haul & swatches, swatches, swatches! 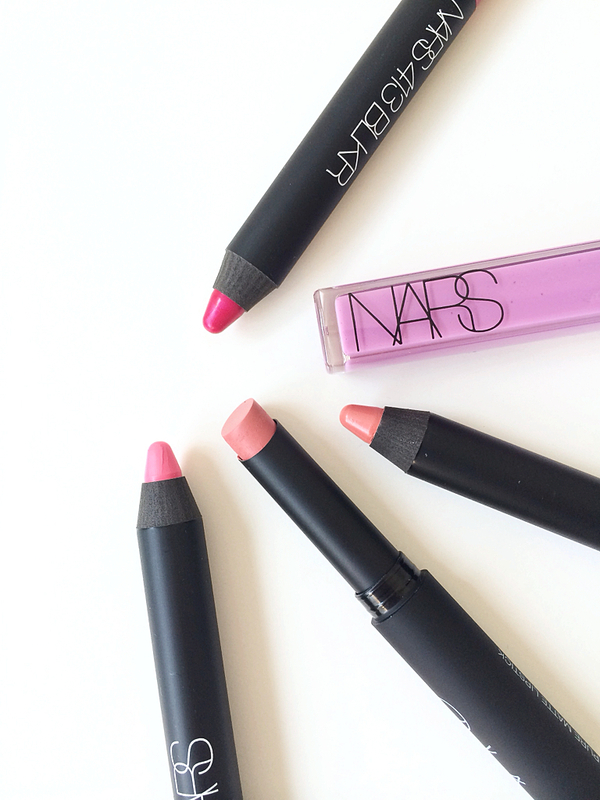 NARS, one of my favourite brands. In my opinion, no one does wearable colour like they do. And more often than not, the quality is top notch. Here’re a bunch of lip products I treated myself to recently. Some are from the newly released Final Cut collection and some from the permanent line. All in all, I can’t even begin to explain how much I am looking forward to sharing them with you. 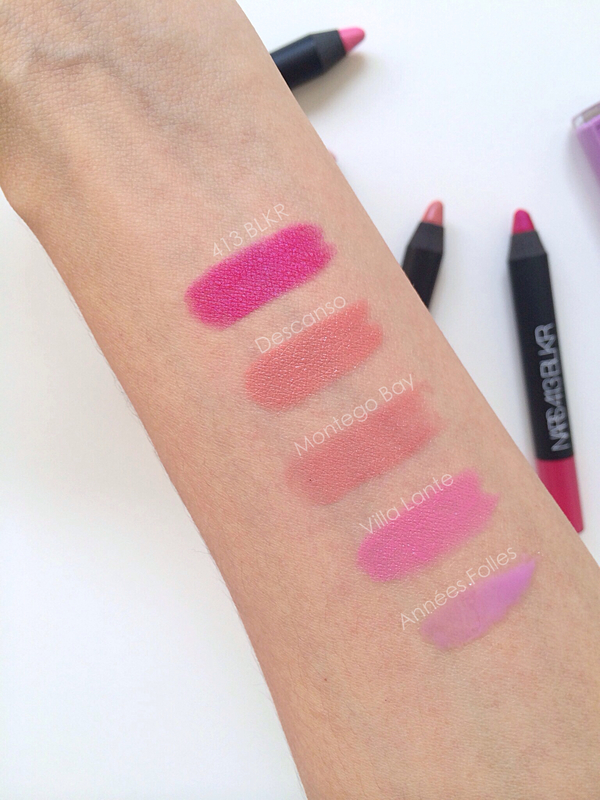 413 BLKR Velvet matte lip pencil, this is a medium fuchsia with an iridescent blue sheen to it. Although the blue is not visible once applied, it’s clearly noticeable upon close inspection. This was my first pick from the boutique exclusive range. If you happen to come across this collection, don’t leave without at least one product from this line! It’s utterly exclusive, given that it’s only available at NARS boutiques in the U.S and not at the counters or Sephora. Descanso Satin Lip Pencil (LE), this is a warm rose peach shade. 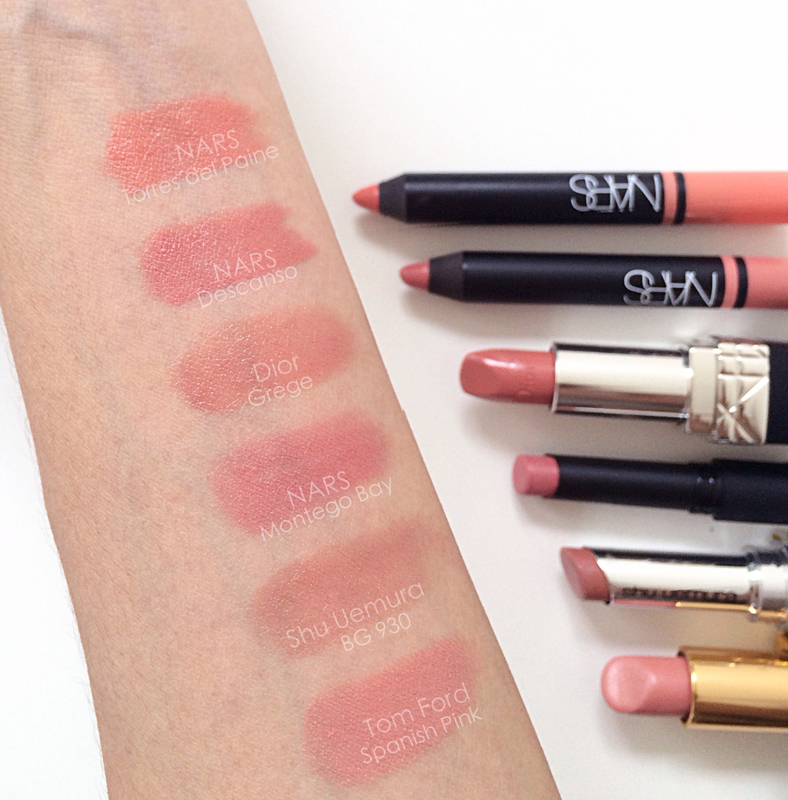 It is by far the prettiest Satin lip pencil that NARS came out with. I’d say this is a must have. 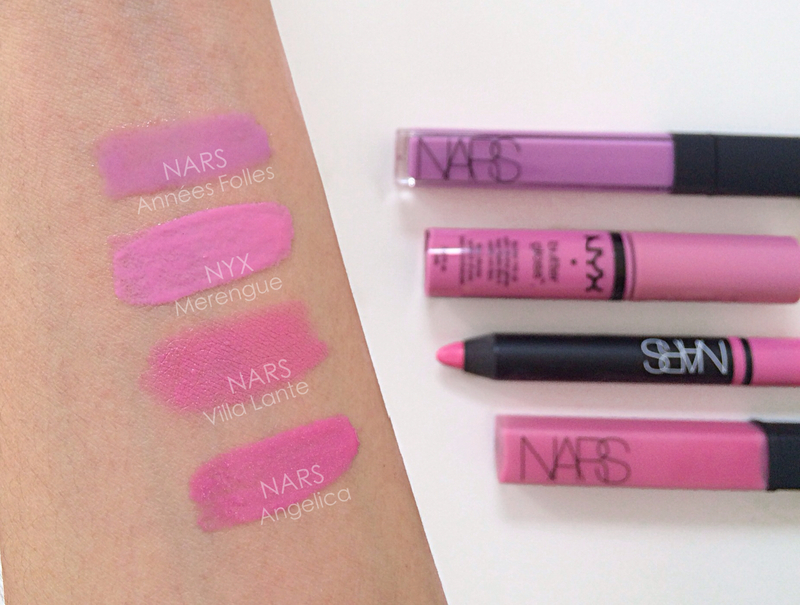 It’s super flattering and not too warm or too cool, a great everyday shade for a girlie, pout. Montego Bay Pure matte Lip stick, this is a medium rose pink. I like that even though this is a matte lipstick, it feels creamy enough to apply without too much drag. I find this too a great everyday colour, not too bright and little muted, an ‘office-friendly’ shade. Années Folles Lip gloss (LE), a medium lilac. A very versatile gloss in my opinion. So far I have been loving this for cooling down any lipsticks that I feel is too warm. A great layering product. Another thing that’s worth mentioning is that although in the past NARS lip glosses had a bad reputation of being sticky and smelling unbearable, I am happy to report it is no longer the case. I am really glad they reformulated. So far, my absolute favourites are the Satin Lip Pencils. They are my go-to lip products. So easy to carry along for touch ups and the wear is great as well. They always fade so evenly, which is a plus so I don’t have to keep looking at my compact mirror to make sure my lips look ok.
413 BLKR is deeper than Urban Decay Anarchy and less bright than Hourglass Fever. 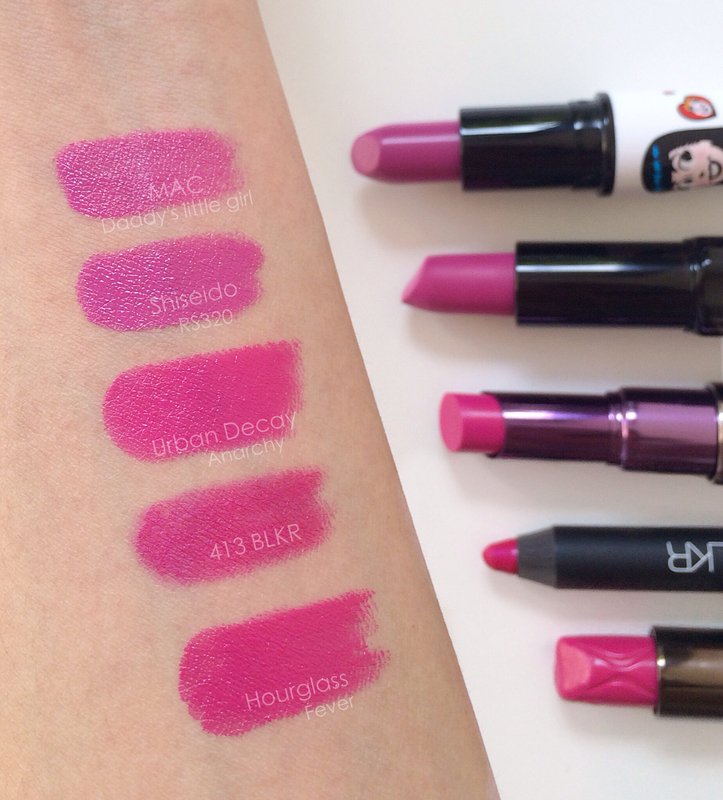 The Shiseido and Mac ones clearly are more purple than Fuchsia. Descanso is more pink and than Torres Del Paine and a little deeper and rose than Spanish pink which leans more peach. Montego Bay leans more cool than Dior Grège and more rose than Spanish pink. For Villa Lante and Années Folles I found it difficult to find similar products in my stash as I don’t own too many cool toned pinks or lilacs. But here’s what I did find 🙂 Nars Angelica is darker and slightly more blue toned than Villa Lante. And NYX Merengue is more milky, opaque and pinker than Années Folles. So that’s a wrap folks! Hope you found this post useful and for those who are living in Singapore, I found out that more stocks of Villa Lante and Descanso had arrived, but they are running very low, probably the last two or three. So try reserving them today before the Tangs rebate sale happens on Friday. You can reach Julyen, my favourite makeup artist at NARS at the Tangs outlet 65-62350967 to do the needful. Wishing all of you a wonderful day! Blueberry goodies by The Body Shop! Great tip! Will try that out! Lovely swatches, Bubs! They all look so yum. Your blog is just amazing! You’ve got soo many great products and i love your photos. You are so kind. I try my best to take nice pics and do relevant posts to the best of my abilities. Michelle thank you SO much for doing the comparison swatches-I REALLY want the BLKR pencil but as we don’t have Nars in Dubai any longer it’s going to be hard for me to track down-but now I have other options yey! The Urban Decay is so close!! I also regretted not buying Descanso BUT I actually own Dior Grege, Nars Montego Bay and Tom Ford Spanish Pink so looks like I am set! !